If you want to sit back with a drink or get up and dance, the best nightlife locations in CT can be found right here. Get up off the couch and head to some of the best places around with a few friends. 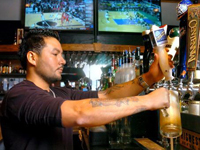 CT has some great nightlife destinations, which of course include the best bars around. Check them all out now and see why each bar qualifies to be on this list. Get ready for the night of a lifetime at one of the best Connecticut clubs. When the sun goes down, the party starts so make sure you stop by and stay all night long.